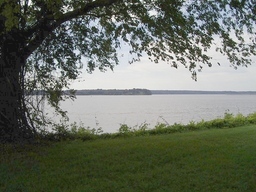 Visiting the James River Plantations? Want visit the James River plantations? These huge old estates--so-called because they overlook the James River--include Shirley, Berkeley, Westover, Evelynton, Edgewood, Piney Grove, Carter's Grove, and Sherwood Forest. The entrance at Berkeley Plantation. While Shirley is our favorite (keep reading for full review of Shirley, plus the answer to the question "What's a dovecote? "), you can take your pick of the estates along John Tyler Memorial Highway (Route 5). Several are open daily; others are private homes and can rarely be seen, except during the annual Virginia Garden Week. Here are facts about the other estates along the James River...plus why you shouldn't rely on guidebooks or out-of-date websites when planning your visit. This is surely the grandaddy of all James River Plantations, plus our family's personal favorite. It's got a fabulous location, multiple outbuildings, and so much more. Click here to read why we like Shirley best! Berkeley, built in 1726, is the birthplace of Benjamin Harrison, one of the signers of the Declaration of Independence. His son, William Henry Harrison, was America’s 9th president. Built of brick in the Georgian style, Berkeley is also the place where the first official Thanksgiving took place in 1619. I haven’t been on the Berkeley tour in years, but I saw it on the same day I visited Sherwood, and for some reason, the Sherwood tour was more memorable (I think because they actually had us practice a colonial dance—you know, more hands-on). Berkeley is open daily, every day except Christmas. Admission: $11.00 per adult, $7.50 per student (ages 13-16), $6 per child (ages 6-12), free for kids under 6. 10% discount: AAA members, Military and Senior Citizens. Open 9 am – 5 pm daily, except for Thanksgiving and Christmas. Location: south side of Virginia Rte. 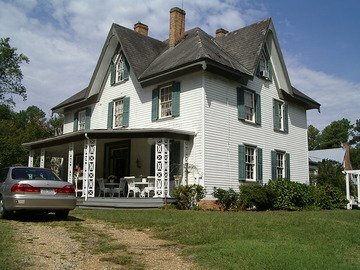 5, six miles west of Charles City Court House - 804-829-6018 or visit www.berkeleyplantation.com. Westover overlooks the lovely James River. Unfortunately, Westover, which has been called the best example of Georgian architecture in American, is rarely open to the public. (It is the private home of the Fischer family.) Your only chance is once a year during Virginia Garden Week. If you have a group, you can call to arrange a tour of the first floor only. 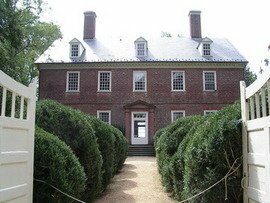 However, for a small fee you can walk the lovely grounds at Westover, enjoy the view of the James River, and see a yew tree planted by George Washington. The grounds are open M-S, and cost $5 or adults and $2 for children. They will also arrange private tours of the interiors for $15 per person (10 person minimum). Location: 7000 Westover Rd. on the south side of Virginia Rte. 5, six miles west of Charles City. Call 804-829-2882 or go to their website. Westover shares an entrance with Berkeley, so if you want a peek of Westover’s grounds (although you won’t be able to really see the house) you can stop by for a quick view, then move on to Berkeley. Sherwood Forest was the home of President John Tyler, our 10th president, who bought it to be a retreat from the rigors and bustle of Washington, DC. The original house was built in 1730, but was renovated by Tyler in the mid-1800s. It’s still owned by one of Tyler’s descendents, who participated last year in the dedication of the Jamestown Children’s Memorial. As I mentioned, the most memorable part for me was the ballroom, which is long and ridiculously narrow—the complete opposite of most grand ballrooms, which are square or rectangular, cavernous, and provide lots of room for couples to twirl around the floor. “How could this be a ballroom?” you think, as it would be nigh impossible to waltz here. Turns out they only did the Virginia Real and other line dances for which the room is just the right shape. Tours of the house are available daily from 9 am to 5 pm, except for Thanksgiving, Christmas, and New Year’s Day. Admission for adults is $10.00; children are free (although I don't know what ages that includes). Location: 14501 John Tyler Memorial Hwy - (804) 829-5377. For details, go to their website. Rats. As I prepared this page, I planned to mention that Carter's Grove was no longer accepting tours. This wasn't a surprise because its sale had received national attention last year. What I was surprised to find out was that Evelynton is now closed too. I had to cruise through multiple guidebooks and ridiculously out-of-date websites to learn this. I finally had to call their old phone number to confirm it. My point? There is a lot of out-of-date info out there about these estates. That's why I'm doing my best to get the real scoop! But you should probably call the houses before your visit, just in case. 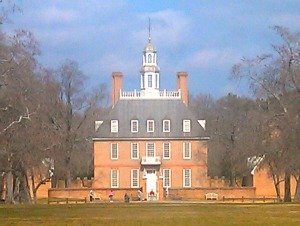 Carter's Grove is reminiscent of Colonial Williamsburg Governor's Palace, seen here. After being sold by the Colonial Williamsburg Foundation in 2007, Carter’s Grove is now a private home. Originally a part of Berkeley, Evelynton is home to the Ruffin family, whose ancestor, Edward, has the dubious honor of firing the first shot of the Civil War. If the house looks newer than other James River plantations, it’s because it was built in 1935 on the site of the first plantation. I have no information why or when they stopped accepting tours. Edgewood does weddings, Victoria teas...and elopements! Want to spend the night in a James River estate? You can! If you'd like to do more than just tour the mansions, here are three that operate as bed and breakfast inns. One thing to keep in mind: Route 5 is a lovely but lonely stretch of road, with next to nothing on it but plantations and huge estates hidden in the trees. No rest stops here. So plan ahead on getting gas and food! If you like mansions, you might also visit those near Charlottesville. These include Ash Lawn-Highland, home of James Monroe, Monticello, home of Thomas Jefferson, and Montpelier, home of James Madison. - Route 15 (about one hour west of Richmond and 20 east of Charlottesville). Get off I-64 at Zion Crossroads (exit 136) and go north on Route 15 to Gordonsville (whatever you do, don’t speed in Gordonsville—it’s a major speed trap!). Take a right on Blue Ridge Turnpike (US 33 West) and make a right on VA-20 to Montpelier. While not a plantation, another historic home you might enjoy touring is Maymont in Richmond. It’s a beautiful example of a late 19th century Gilded Age estate, funded by “robber baron” money.